Just as with China, we seemed to be making a habit of having a new kid every time we visited Canada. First was Toronto, when Cleo was just three months old. Then we took Cleo and Ian to Vancouver, and now we were on our way to Montréal with all three of them. My research had made me super excited about this part of our trip, mainly because it seemed like there was a great mix of ethnic cultures, diverse neighborhoods, and an abundance of European-style produce markets. The last time I'd been in Montréal was twenty years earlier on a work trip, long before I developed a genuine interest in travel, so this was essentially a first visit for all of us. Our arrival was undistinguished, thanks to a steady rain that contributed to one of the worst traffic experiences we've had in our travels. I don't know what the traffic's like on a regular basis, but if that was a typical weekday afternoon I feel sorry for anyone who has to drive to work there. It took us an hour to get to our Airbnb even after we'd reached the outskirts of the city. Mercifully the kids slept through the entire process. I don't know what we'd have done if one of them had woken up and clamored for the bathroom while we were in gridlock. It was still raining hard when we arrived and the only spot available was illegal, so it took some maneuvering to get everyone indoors without getting soaked or getting a parking ticket. Once I found a legal spot and walked back to the apartment, I found it was one of the nicest Airbnb's we'd ever stayed at. Aside from being freshly renovated and immaculately clean, the place was full of character with brick walls and hardwood floors. The kids bedrooms and family rooms had a nice lived-in feel with plenty of toys to play with. I'd chosen the Mile End neighborhood carefully for its central location and heavy concentration of restaurants. Our block had a very cozy, residential feel with dense trees nearly concealing the rows of brick townhouses from the street. On our corner was an enormous church with a very distinctive style including a very Byzantine-appearing cupola and minaret, that I concluded must be Eastern Orthodox. When I had time to look it up I found that it was actually the Roman Catholic Church of St. Michael and St. Anthony, whose architect was inspired by the Hagia Sophia in Istanbul. Given the difficulty of finding parking in the area, using the car again that evening was out of the question. Of course, there were plenty of restaurants within walking distance and we settled on a Japanese ramen restaurant a few blocks away. There was a long bar and only a couple of tables in the narrow restaurant but fortunately one at the back was just coming open and they shoehorned us all in. The ramen was delicious and we all ate ravenously. The plan for our first morning was to explore the largest daily produce market in Montréal, Marché Jean-Talon, in the Little Italy neighborhood. We probably could have walked from our Airbnb, but the spring rain had started up again and it's tough to keep three wandering kids dry with two umbrellas. The first order of business was breakfast, and we quickly found the food court at the back of the market where we assuaged our hunger with noodle soups and spring rolls at a Vietnamese restaurant. We hung around for another hour in the market, admiring the colorful displays of fruits, vegetables, meats, and fresh seafood. One of my biggest disappointments living in the United States is that this covered market culture doesn't seem to exist anywhere. People don't seem to realize that there's any other option besides supermarkets. At least the quality and variety of what we get here is good, but the atmosphere of a real market can't be imitated. I'd hoped the sun would have come up by the time we finished with the market, but it was still rainy and chilly by the time we got downtown to the Vieux Montréal area. Naturally, we weren't going to let that stop us so we grabbed our umbrellas and raincoats and explored Montréal's most touristy neighborhood. The streets around Place Jacques-Cartier were very atmospheric despite the preponderance of tacky restaurants and souvenir shops. Just a couple of blocks from the center and perhaps thanks to the rain, we had the beautifully-landscaped blocks of stately stone buildings to ourselves. For lunch we drove all the way to the northern Maissoneuve area for its namesake market, which we found to be much smaller than Jean Talon and almost empty. The seedy nature of the surrounding area probably contributed to the lack of patronage. The market had moved from its grand Beaux Arts home to a smaller, modern building in 1995 but we made sure to get a picture of the original location which is now a community center. We put together a light meal that was anchored by a plate of succulent oysters. We drove back south along Rue Sherbrooke, the "Broadway of Montréal", until we reached McGill University. We parked and strolled a little way down the busy street and took a peek inside the university campus. We drove around the beautiful streets that surrounded the university, admiring the classical architecture of the mansions and academic buildings. The streets were starting to get choked with rush hour traffic but we didn't mind the slow pace of the drive. We decided to head all the way back downtown to look for a place to eat in Chinatown. It was still early, but we hadn't eaten much at Maissoneuve and were looking forward to a good Chinese meal. Montréal's Chinatown was OK, but not anywhere near the level of the ones in Manhattan, Brooklyn, Boston, or San Francisco. We had trouble finding a restaurant whose menu we liked, but eventually Mei Ling found an outpost of a mainland Chinese hotpot chain she knew and we had a decent if unremarkable dinner. We weren't expecting the relatively small Atwater Market to blow away Jean Talon, but it turned out to be the best market we'd ever visited in the US and Canada combined. The market is adjacent to the Lachine Canal which traverses the southwestern part of the Island of Montréal. The first thing we encountered was the outdoor food court, so we had a solid breakfast of satay and other freshly-cooked delicacies before even venturing into the market. The produce displays in the outdoor section were even prettier than at Jean Talon, and we bought as much fruit as we could eat. Once we entered the indoor section of the market, we regretted not having left ourselves any room for more food. The butcher stalls were phenomenal, and there was plenty of mouth-watering prepared food at the many delis. There was also an enormous bakery and coffee shop from which the warm smell of freshly-baked baguettes wafted temptingly. We resolved to return the next day before leaving Montréal and reluctantly took our departure. 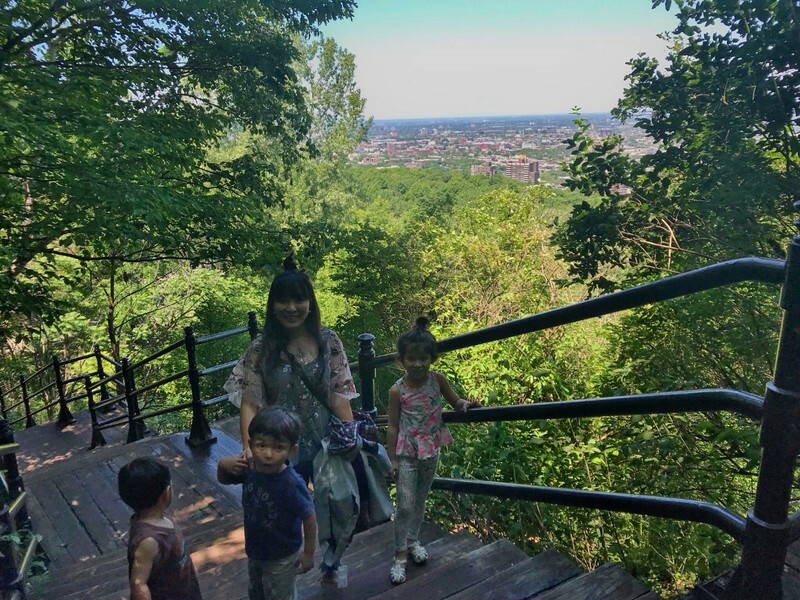 Most visitors' initial impression of Mont Royal Park is the George-Étienne Cartier Monument, which celebrates the respected statesman's contributions to the formation of the nation of Canada as an Anglo-French confederation. The prominent position of the "angel statue" on the major thoroughfare of Park Avenue has led to it becoming emblematic of the city. We entered the park close to the statue and drove up to the overlook, where we enjoyed panoramic views of the city and took the short hike to the summit. The Oratoire Saint-Joseph was on the bubble of my list of sights, as we usually don't make special efforts to visit churches and cathedrals, but we were making decent time so we decided to make the short drive from Mont Royal Park. As it turned out, it was a spectacular building and it would have been a shame to have missed it. Despite the unassuming appellation of "oratory", which usually describes a small chapel, Oratoire Saint-Joseph has been enlarged multiple times since its original construction and now boasts one of the largest church domes in the world. Coupled with its hilltop location, the church has an incredibly imposing and majestic appearance. There are several levels of terraces and balconies from which one can look out onto the well-manicured grounds and the attractive residential neighborhood of Côte-des-Neiges. Côte-des-Neiges is well-known for all kinds of Asian and Caribbean restaurants so we drove from the Oratory down Rue Côte-des-Neiges and eventually selected Poisssonerie, a Middle Eastern fish market and restaurant where we chose our own fish from the market to be grilled for lunch. I have a soft spot for botanical gardens when we travel, so we schlepped back up to the northern part of the city to visit Jardin Botanique de Montréal. The long walk from the street to the botanical garden features the Montreal Tower in the background, which is the tallest inclined structure in the world. The botanical garden was divided into special areas with Chinese, Japanese, Alpine, aquatic and other themes, each with its own individual kind of beauty. There were also some interesting trunk-like play structures that the kids loved. We got out of the Botanical Garden just as it was closing and drove to the last place on my list of Montréal sights, Square Saint-Louis. The square is famous for the brightly-painted Victorian row houses, of which photos will be found in any Montréal guidebook. Here's our obligatory version of the ubiquitous photograph. We let the kids stretch their legs in the park that occupied the square and enjoyed lemonade and games in one of the many cafes on nearby Rue St. Denis. Walking south from the square, we found ourselves on a pedestrianized street with busy outdoor cafes. We followed the sound of music to what turned out to be an enormous street party on Boulevard Saint-Laurent. There were numerous food stalls, which rendered any search for a restaurant for the evening unnecessary. The kids had tons of fun dancing and participating in sports contests they had absolutely no chance of success in. There was also a breakdancing crew featuring a dancer with just one leg, which was a first for me. It was amazing what we had accomplished in just two days in Montréal. We had been just as busy as we had been in great European cities like Rome and Barcelona, and we felt that we had experienced a truly world-class city. We decided that Montréal was our new favorite city in Canada, and resolved to return for a longer stay. We still had one last reward for ourselves for our hard work touring the city, which was a decadent feast at the indoor gourmet food hall at Atwater Market on our final morning in Montréal. We carefully selected a warm, fragrant baguette, a sizable hunk of foie gras, a wheel of chèvre, and some green olives and stuffed ourselves to groggy oblivion. We stocked up with fresh fruit and Lego candy for the long drive ahead of us and headed back towards the border.